Namine’s independence has been on her mind a lot, especially since we replaced her closet doors and hanging clothes with a large shelving unit. 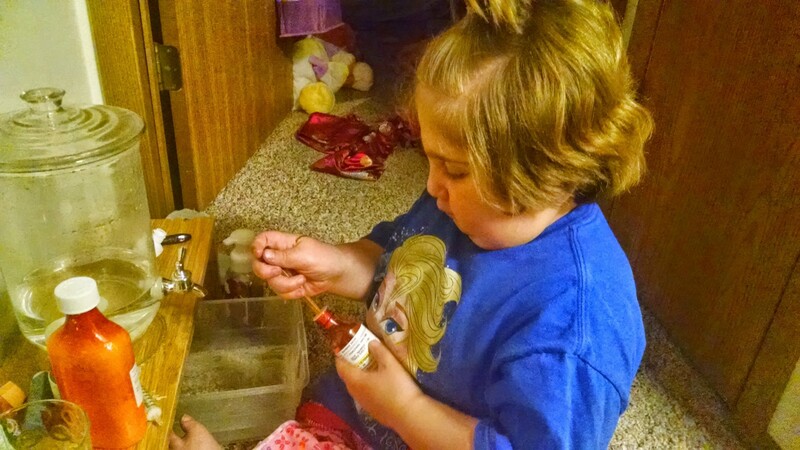 She asked me a few days ago if I would teach her to draw her own medicine. I was happy to oblige. It just so happens that we have little stoppers for all Namine’s medicine bottles. It makes it easier for us — less spillage — and looking ahead to Namine drawing her own medicine, it provides a nice stepping stone for her to get used to holding the bottle with one hand and drawing with the other. I started Namine with her heart medicine. The bottle is nice and small, and the stopper is a snug fit in the bottle. Namine was able to jam the syringe into the stopper pretty hard, and that kept it in as she turned the bottle upside down to draw. 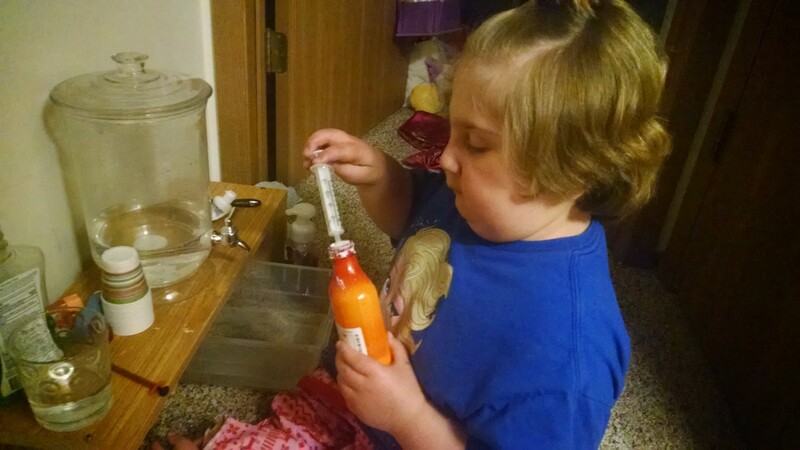 I showed her how air can get into the syringe the first time, so she drew and pushed the syringe a few times to make sure she got her full dose. Then it was on to her second medicine. The bottle is bigger, but that didn’t seem to be a problem. It’s actually been a few nights now that Namine has drawn her own medicine. She still needs a little help, and she hasn’t quite gotten the hang of having to hold the bottle and the syringe, as well as pulling the syringe’s plunger at the same time. She still needs a third hand, which I am happy to provide. The important thing is that she’s interested in drawing her own medicine. 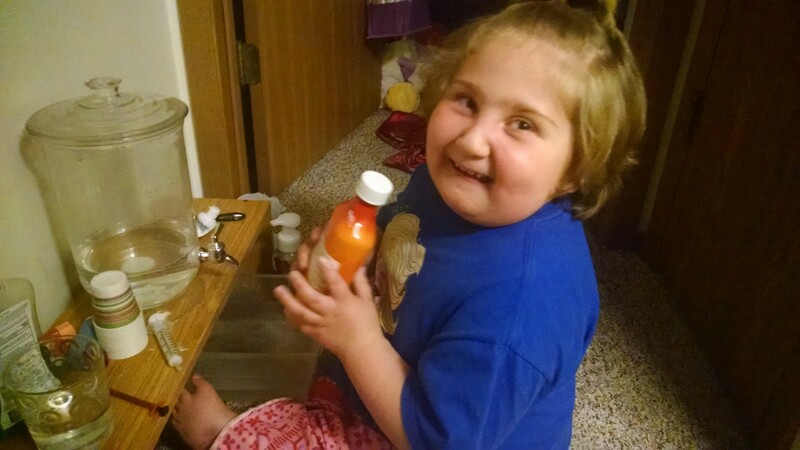 It shows that she understands the importance of her medicine beyond just “Mom and Dad say I have to drink it,” and that she cares about taking care of herself. As far as I’m concerned, she’s already shown that. But this next step — not only being willing to draw her own medicine, but showing an interest in it — indicates a maturity beyond simple obedience. And as always, a healthy dose of a smile and a cheerful attitude. You are so wise to encourage Namine’s independence. Little steps now mean she’ll be better able to practice self care as she gets older. Thanks for sharing her progress at DifferentDream.com’s Tuesday link up.